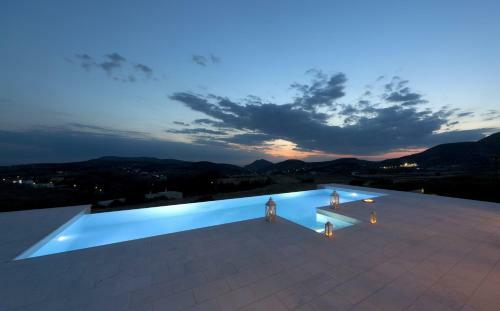 Casa Del Sol Syros is located in Syros, Cyclades Islands. Casa Del Sol Syros offers to its guests tennis court, garden, outdoor	and salt-water pools. As for the children is games room. The property offers family room and other might be available upon request. The rooms provide sea view, landmark view, garden view and pool view. Amenities of the rooms include air-conditioning, heating, tv, fridge and more. Each unit has own bathroom with hairdryer and free toiletries. In the kitchen there are microwave, kitchen utensils, dishwasher, fridge, hot plates and oven. Free wifi is available at the hotel room. Pets are allowed with prior agreement with the villa. Fields with * are required. The enquiry is sent directly to Casa Del Sol Syros.